For a list of new features in Fiery makeready products for cutsheet users visit the Fiery Impose, Fiery JobMaster, and Fiery Graphic Arts, Premium Edition webpages. For more information, visit the what's new guide. Easily migrate archived jobs from the Fiery server to a network storage location. Watch overview and migration videos. Find jobs faster to take quicker action. Basic and advanced search tools help you create custom views or filters to prioritize and plan print production. Users can change key job settings without opening Job Properties. This function moved to the Job Summary pane to improve speed and precision of edits. 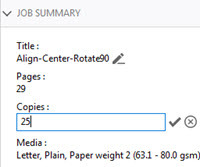 Administrators can easily edit default settings to make sure that all jobs use consistent settings to comply with standard print requirements. We improved the Color tab so you can see all the color settings in one screen for faster setup without having to open additional windows. 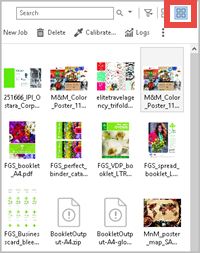 This new interface allows users in a multiple-printer environment to monitor their printers from a single view. It offers an at-a-glance status of all connected Fiery servers for a high-level overview of the current state of printers. You also get a snapshot of key print production statistics during the last week. Command WorkStation offers administrators a simpler way to get notifications, downloads, and installation of approved and released Fiery system software updates. You can perform updates from remote client computers, so you can still update servers that may not be connected to the Internet. Fiery JDF 1.6 provides numerous enhancements for integrated workflows with EFI Productivity Software, as well as in-house custom integrations. For more information visit the Fiery JDF and Fiery API web pages.